Hey everyone. This has been a semi-secret project in the works for a couple months now. It's a long read, so skip to the end if you just want to see the finished product. Some of you may know of my DIY 2-axis gimbal builds that I have done using wood and acrylic in the past. Well, back in December I became the proud owner of a 3D printer which opened a huge door for me. At the same time, I was building a TBS Discovery platform for AP use and had the desire for a 3-axis gimbal. Buying an entire 3-axis gimbal was out of my budget, but I did have three gimbal motors available from my earlier builds. At the same time, three axis gimbal controllers had finally come down to a price I could afford. I searched around the internet for 3D printable 3-axis gimbal designs, but to my dismay I didn&#8217;t find anything I liked. There were few gimbal designs out there to start with. Most of them were just 2-axis and clunky and heavy looking. So I decided to design a 3D printable 3-axis gimbal myself. 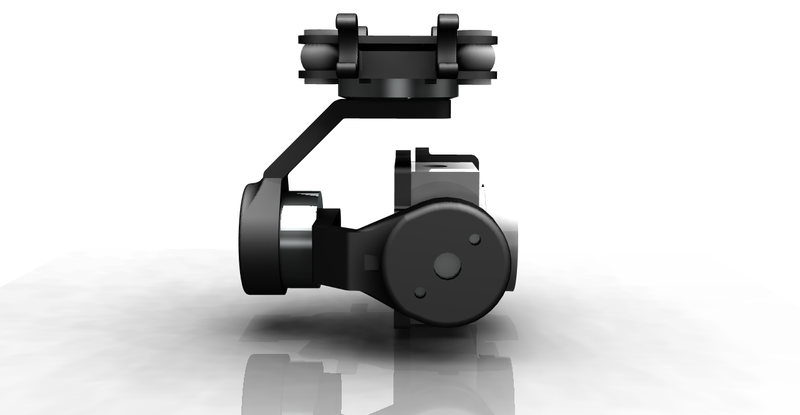 A challenge for sure, but it gave me the power to design a gimbal I liked, with the characteristics I wanted. For starting points in the design I took a look at some well performing and attractive gimbal designs that are commercially available. Gimbals like the FeiyuTech mini 3D and SteadyGim3. Gimbals like these utilize a minimal amount of material to hold the camera and are only as wide as the pitch motor and camera side by side. They are very minimalistic, yet perform well. Taking these characteristics as inspiration, I designed all the parts in CAD and printed the very first prototype. When designing, there is only so much you can predict before actually making the product. One of the things I could not easily determine (I&#8217;m sure there is some way), is the balance point of all three axis. The balance point determines the necessary arm length and if known can reduce the overall size of the gimbal. So the first parts I printed where rough designs of the pitch, roll, and yaw assemblies. That is why the arms are extra long at the adjustment points. 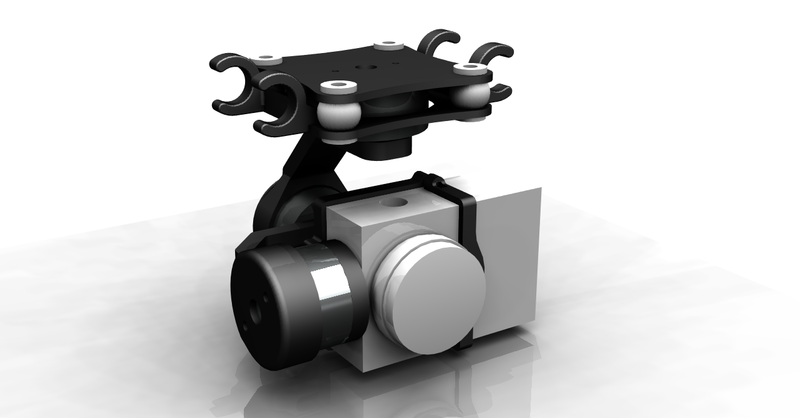 I then balanced the gimbal on each axis and updated the design from there. It also served to determine if any bolt holes were out of alignment or needed to be enlarged. V2 of the design started with adjusting part lengths and positioning in CAD then printing the entire updated gimbal. With this prototype, all the parts could be tested together and reprinted individually to fine tune the design. Over time this gimbal became V3, the current version. 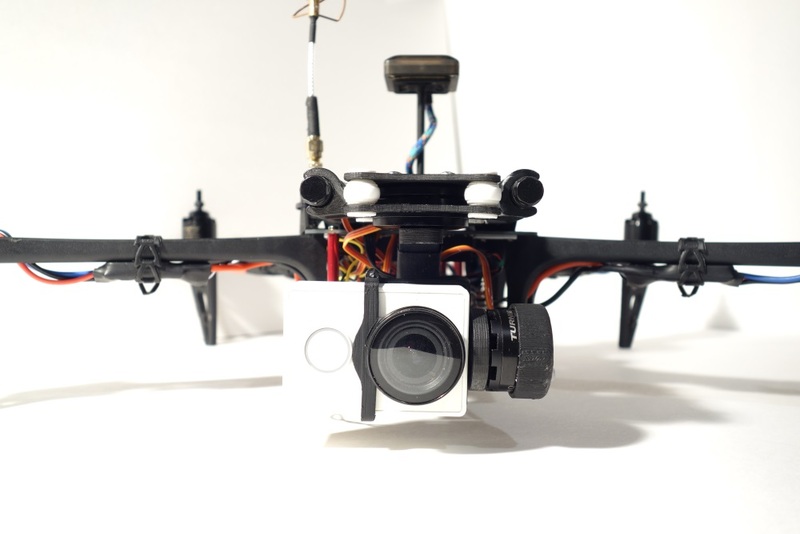 It utilizes a rail system to easily add and remove the gimbal and controller from the airframe. All the printed parts are printer friendly and do not require supports. The gimbal is easily assembled and balanced, and weighs less than most commercial action cam gimbals. Version 3 is composed of 23 printed parts, all of which will be available on Thingiverse. It is designed specifically to mount a Xiaomi Yi on a TBS Discovery (see my build log), so as a result the roll is not full range. I will however upload longer versions of the yaw arm and a mounting bracket to suit GoPros to Thingiverse as well to support those who want full range of movement and use GoPros. I cannot guarantee full GoPro compatibility though, unless I somehow get one in my hands. Controller: Micro Storm32 (unfortunately I do not recommend this model due to it's limited functionality and difficulty to flash, but it works for this project). Thingiverse page. If you are using slightly different components and need a tweak to the design let me know! I can make a adjustments and send the files your way. If you&#8217;d like to support me and more projects like these, consider subscribing to my youtube channel, or following me on Instagram, facebook, or twitter. I&#8217;d love to get feedback and suggestions for future mods and projects. hey cool project. it turned out really nice.. i have to admit i was surprised by how many parts there was..
i think i will buy a js4000-5000 wifi action cam. they go for about 40.00 now.. which is does not hurt the wallet as bad if you crash one. that is what i plan to use on my 600 size AP machine.. last week a small FPV monitor arrived.. i bought one of the Hyperion 4.3" Fpv Monitor jobs for 60.00 it will work perfect for framing a shot.. i did not want the weight of a 7" so this was perfect solution.. and even Dutch from here gave it a glowing review and i have to agree its such a pretty screen and easy to see out side which was a must for me being a desert rat. anyhow very cool project, ill get a 3d printer one-day.. this hobby and a 3d printer are made for each other. how much does your gimbal weigh compared to a CNC aluminum job.. i was under the impression you wanted some mass so i originally thought aluminum was a ideal source material to use.. so when i saw carbon fiber versions i was like blah.. but i guess weight could be problem.. and lighter is better so the quad or hex or even a penta ( see latest thread on crazy push prop quad thing from fox )can lift it and extend flight time. anyhow thanks for sharing.. it will be fun to see what others do with the source as others down load it and tweak it to there needs.. i love open source. Finally. 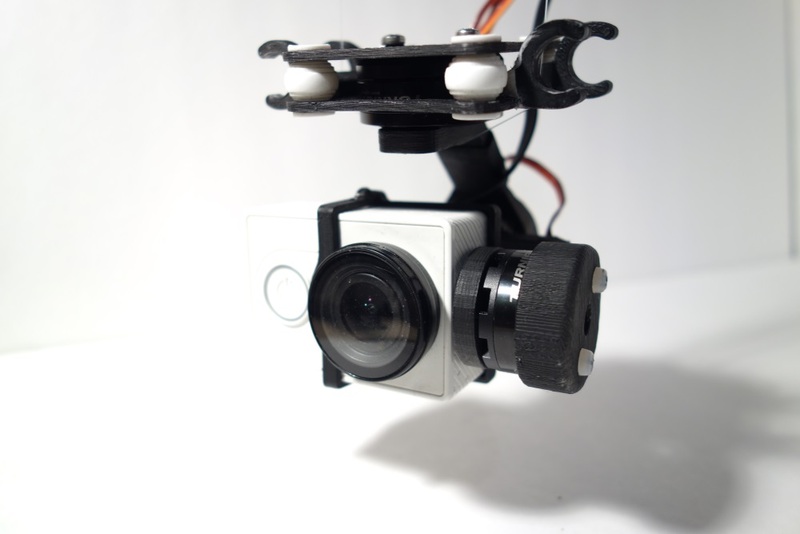 I have been waiting ages for a 3d printable 3 axis gimbal. I wanted to design it myself but my design skills are not up to it. Nice job. That looks like a very clean design. I can see you spent some time working this out. I will log in and sub your channel soon as I finish posting this. Thanks Chris, Paul and Psyborg! 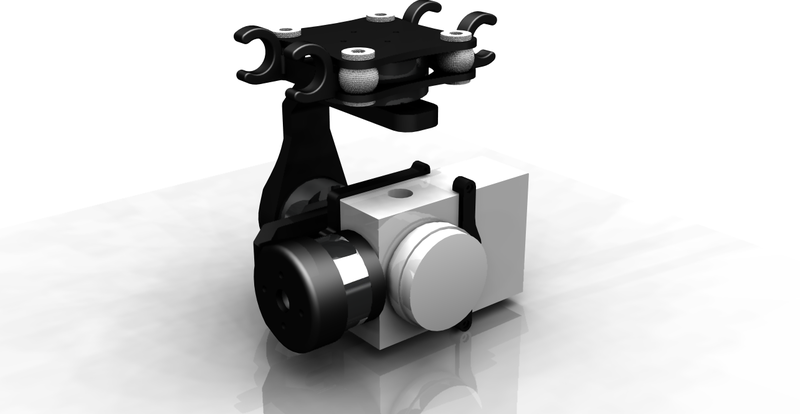 I'm hoping this design will provide a nice solution for the DIY gimbal enthusiasts out there. From the initial testing this gimbal has outperformed all of my previous builds. Not only in stability, but in user friendliness. I'm working on a nice video to show what this gimbal is capable of. Looks great! I still want to tackle a gimbal one of these days...just no time and can't decide on motors. I only count 17 parts though...I'm guessing some are used more than once? Out of curiosity what did you do the design in? Looking forward to a video! Thanks! If I were to buy more gimbal motors I would looks for something with a hollow shaft or slip ring. Keeping the wires from interfering or tangling with the rest of the gimbal can be frustrating. 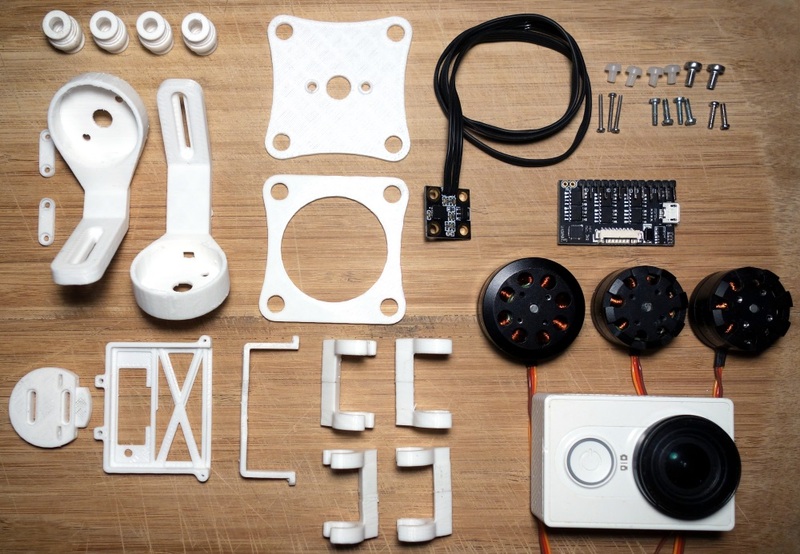 There are 17 parts in that picture and 6 more for the gimbal controller housing, which you may or may not need depending on if you use the same controller I used. I did all the designing in NX 9.0 which has the renderer built in. Very nice design work. I'm slogging through all of the Fusion 360 tutorials just now. 3D design is not easy and this is my first experience. You did a great job. What printer and filament are you using? STLs to support GoPros and full size Storm32 boards have now been added. Once again no guarantees they will fit perfectly as I do not own the newer GoPros or a full size storm32. Let me know if you try them and find areas that need adjusting. Thanks! Yes 3D design can be slow at first, but it is such an important asset when designing projects. Especially when you own a 3D printer! I am printing in PLA because that is all I have. PLA is both stronger and more rigid than ABS so that might contribute to a more stable gimbal. I won't know for sure though until I get some ABS. ABS has some idiosyncrasies. An enclosure is almost a necessity for large/thick parts. I also have been playing with HIPS with very good success. I broke the yaw arm after a fall from twenty feet or so into some soft grass. Unfortunately after the landing gear the gimbal is next to take an impact. Luckily it was just a simple break along the print lines that I could have just super glued back together. Admittedly the yaw arm already broke once under the weight of the rest of the gimbal just sitting on my tuning stand. It may have been that my layers weren't sticking very good. I suggest printing the yaw arm with 20-30% infill and maybe two or more perimeters. Instead of repairing the broken yaw arm I printed up a new one with 25% infill. We'll see how it holds up. Also I am trying to get out to the field to get a video filmed with the gimbal in action! Remember this is only the first video of many for this setup. I have many locations and uses for it planned so subscirbe to my Youtube channel if you want to see those when they come out (shameless plug)! Thanks Jason! I was looking at the same deal yesterday. The motors would probably fit because they are also 220X size. You'll also get the vibration dampening balls as a nice extra. I'm not sure how the bolt holes will like up though. If you want to play it safe you can pick up the exact motors I used for $10 a piece for the smaller ones. If you do use other motors though I can easily make tweaks in the design to suit your needs. 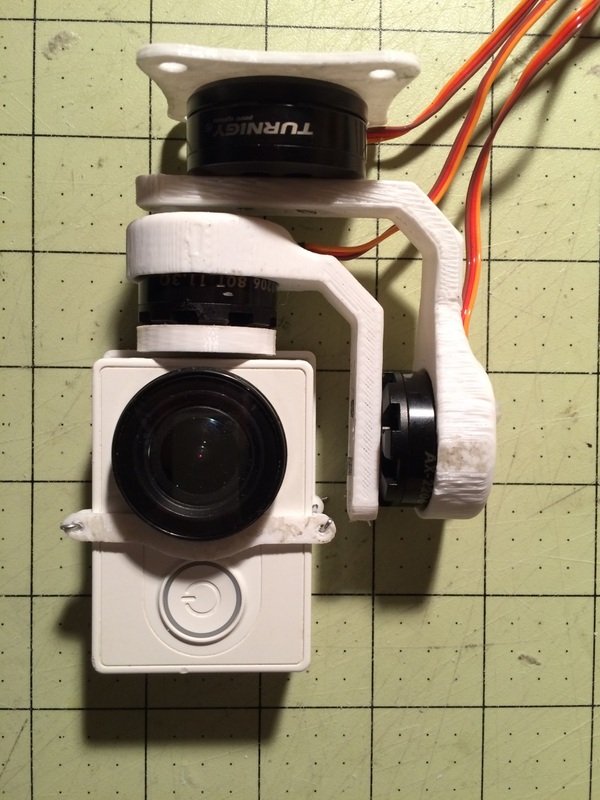 Hey everyone, there is a contest going on at Instructables for drone related projects and this gimbal is one of the entries! Additionally another one of our forum members, jhitesma, has his ultra budget mini quad (UBMQ) entered into the contest. If you like our projects and want to support your fellow forum members, please consider voting for us. You can vote for multiple instructables! You can vote in the upper right hand corner, or just give our projects a read. Thanks everyone! Thanks Jason, you got my vote as well! I probably wouldn't have found the contest if it wasn't for your UBMQ post anyhow. Tonight I updated the firmware on the Storm32 controller to the latest version. I had been putting it off because the gimbal performance was really good (with some firmware unrelated jello) and because it is not easy to flash the micro Storm32. 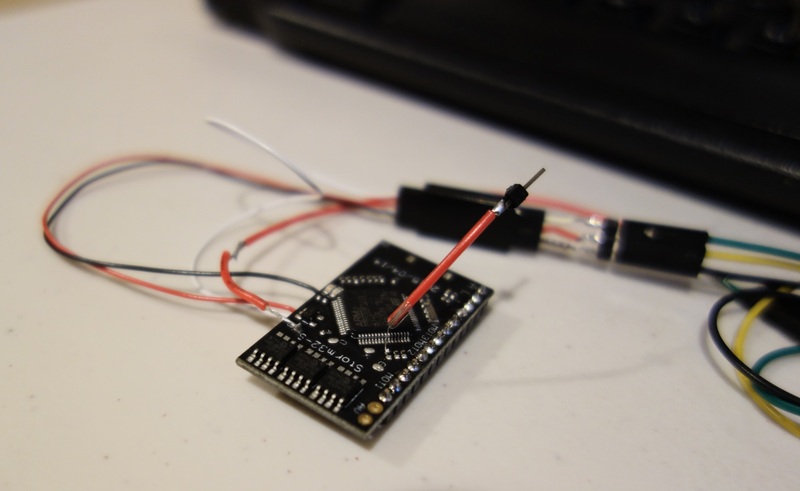 To flash using a USB-TTL adapter you have to short the bootloader by shorting two tiny points on the circuit board. I had to bring out my best soldering skills to do it, and so far there seems to have been no issue updating the firmware. I am hoping the new firmware will give slightly smoother performance and a faster gimbal start up time.